In its infancy, when the universe was a few millionths of a second old, the elemental constituents of matter moved freely in a hot, dense soup of quarks and gluons. As the universe expanded, this quark–gluon plasma quickly cooled, and protons and neutrons and other forms of normal matter “froze out”: the quarks became bound together by the exchange of gluons, the carriers of the color force. 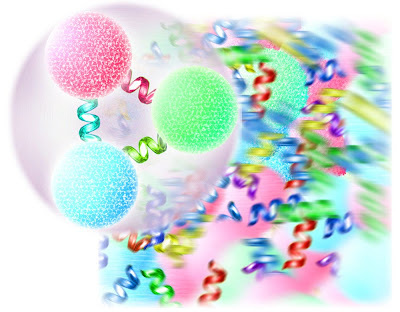 Image 1: An ordinary proton or neutron (foreground) is formed of three quarks bound together by gluons, carriers of the color force. Above a critical temperature, protons and neutrons and other forms of hadronic matter “melt” into a hot, dense soup of free quarks and gluons (background), the quark-gluon plasma. Until recently, lattice QCD calculations of hot, dense, bulk matter could not be tested against experiment. Beginning in 2000, however, RHIC was able to recreate the extreme conditions of the early universe in miniature, by colliding massive gold nuclei (heavy ions) at high energies. Experimentalists at RHIC, working with theorist Sourendu Gupta of India’s Tata Institute of Fundamental Research, have recently compared lattice-theory predictions about the nature of the quark-gluon plasma with certain STAR experimental results for the first time. In so doing they have established the temperature boundary where ordinary matter and quark matter cross over and change phase. Their results appear in the journal `Science' . The authors of the paper are: Sourendu Gupta of Tata Institute of Fundamental Research in Mumbai, India, where the theoretical calculations for this paper were carried out; Bedangadas Mohanty of the Variable Energy Cyclotron Centre in Kolkata, India (He was formerly a postdoctoral fellow at Berkeley Lab); Xiafeng Luo, Hans Georg Ritter, and Nu Xu of Berkeley Lab’s Nuclear Science Division (Luo is also with the University of Science and Technology of China in Hefei, and Xu is also with the Central China Normal University in Wuhan). The aim of both the theoretical and experimental work is to explore and fix key points in the phase diagram for quantum chromodynamics. Phase diagrams are maps, showing, for example, how changes in pressure and temperature determine the phases of water, whether ice, liquid, or vapor. 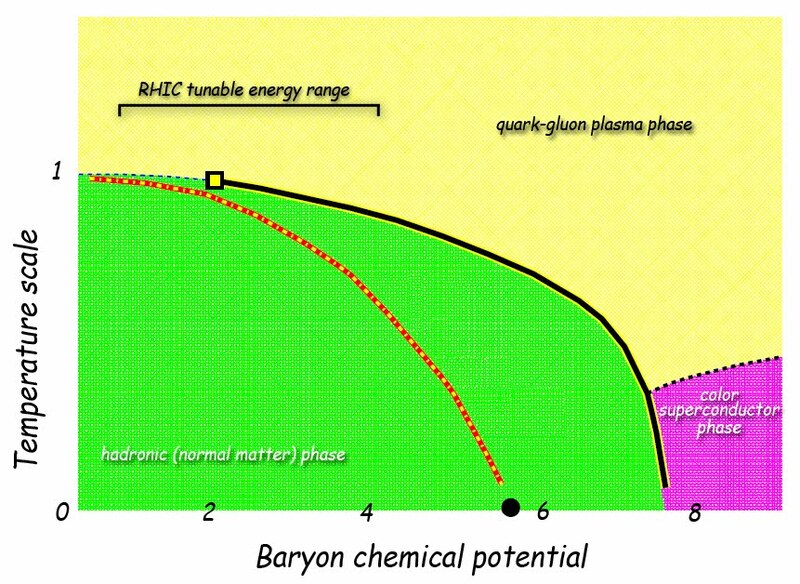 A phase diagram of QCD would map the distribution of ordinary matter (known as hadronic matter), the quark-gluon plasma, and other possible phases of QCD such as color superconductivity. 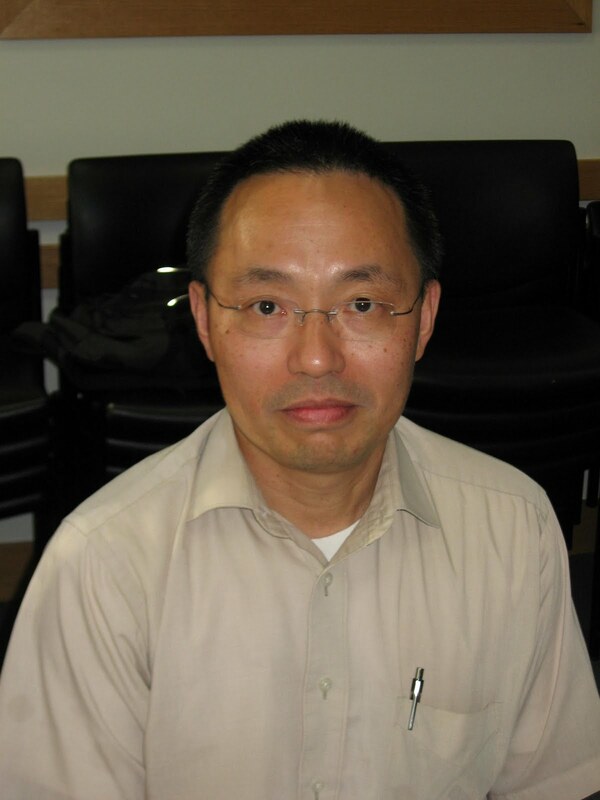 “Plotting a QCD phase diagram requires both theory calculations and experimental effort with heavy-ion collisions,” says Xu, who is a member of Berkeley Lab’s Nuclear Science Division and an author of the Science paper. Experimental studies require powerful accelerators like RHIC on Long Island or the Large Hadron Collider at CERN in Geneva, while calculations of QCD using lattice gauge theory require the world’s biggest and fastest supercomputers. Direct comparisons can achieve more than either approach alone. One of the basic requirements of any phase diagram is to establish its scale. A phase diagram of water might be based on the Celsius temperature scale, defined by the boiling point of water under normal pressure (i.e., at sea level). Although the boiling point changes with pressure – at higher altitudes water boils at lower temperatures – these changes are measured against a fixed value. 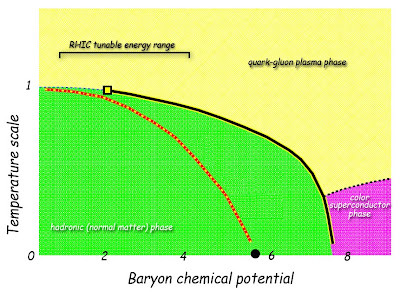 The scale of the QCD phase diagram is defined by a transition temperature at the zero value of “baryon chemical potential.” Baryon chemical potential measures the imbalance between matter and antimatter, and zero indicates perfect balance. Through extensive calculations and actual data from the STAR experiment, the team was indeed able to establish the QCD transition temperature. Before they could do so, however, they first had to realize an equally significant result, showing that the highly dynamical systems of RHIC’s gold-gold collisions, in which the quark-gluon plasma winks in and out of existence, in fact achieve thermal equilibrium. Here’s where theory and experiment worked hand in hand. The scientists were now able to proceed with confidence in establishing the scale of the QCD phase diagram. After a careful comparison between experimental data and the results from the lattice gauge theory calculations, the scientists concluded that the transition temperature (expressed in units of energy) is 175 MeV (175 million electron volts). Thus the team could develop a “conjectural” phase diagram that showed the boundary between the low-temperature hadronic phase of ordinary matter and the high-temperature quark-gluon phase. Lattice QCD also predicts the existence of a “critical point.” In a QCD phase diagram the critical point marks the end of a line showing where the two phases cross over, one into the other. By changing the energy, for example, the baryon chemical potential (balance of matter and antimatter) can be adjusted. Among the world’s heavy-ion colliders, only RHIC can tune the energy of the collisions through the region of the QCD phase diagram where the critical point is most likely to be found – from an energy of 200 billion electron volts per pair of nucleons (protons or neutrons) down to 5 billion electron volts per nucleon pair. Says Ritter, “Establishing the existence of a QCD critical point would be much more significant than setting the scale.” In 2010, RHIC started a program to search for the QCD critical point. Sourendu Gupta, Xiaofeng Luo, Bedangadas Mohanty, Hans Georg Ritter, Nu Xu, "Scale for the Phase Diagram of Quantum Chromodynamics", Science, vol. 332, pp. 1525-1528 (June 24, 2011). Abstract.